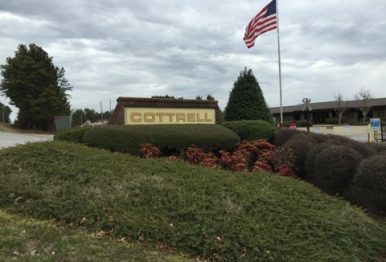 Cottrell is the industry leader in over-the-road car haulers and equipment. We've earned this distinction with innovative products and a relentless desire to surpass our customers' expectations throughout the buying process. Headquartered in Gainesville, GA we are strategically located in an impressive 335,000 square-foot facility on 140 acres. As innovators, we’re proud of these patents we hold in effect on our equipment. We come to work every day to maximize your ability to run a successful business hauling cars. No one will work harder to design, fabricate and deliver equipment that exceeds expectations. Throughout every step of the sales process we will look for new ways to create a positive experience for our customers. Whether you're a large fleet hauler, an independent owner-operator or an international carrier, our goal is that you always view Cottrell as an asset and resource, not just a manufacturer. Even if we don’t currently have a vacancy in your ideal position, we’d still love to talk if you believe you can positively impact our organization. If you are interested in joining us in our quest for excellence, email or fax your resume to (770) 535-2831, or give us a call at (770) 532-7251.